I like to make my choices early. It’s rare that I haven’t decided which record i’ll be taking to the next Devon Record Club within a couple of hours of the end of the preceding meeting. When Nick imposed ‘Turning Points’ as a theme I immediately flashed on records like ‘It Takes a Nation of Millions to Hold Us Back’ and ‘Nevermind’ as records which saw their artists becoming everything they could be. But these aren’t really turning points, more progressions, realisations. I knew I needed to find an artist who had clearly changed direction, and to do so they must have established one trajectory before and another after. Once I started looking for favourite acts with a dozen or so albums, the list started to format itself. Bonnie ‘Prince’ Billy? Well, i’m not sure direction of travel is a property one can ascribe to Will Oldham. The Fall? Plotting their career path would likely sketch out a three dimensional pentagram. 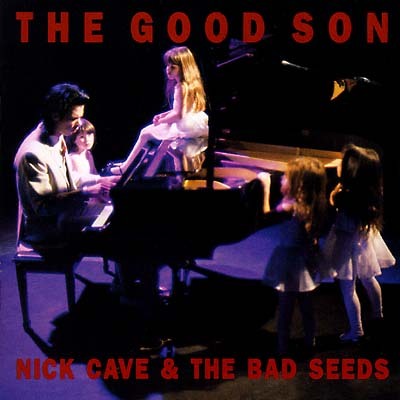 Nick Cave occurred next and ‘The Good Son’ was my immediate and natural choice. Cave and his band are a desert island artist for me. I firmly believe they are one of most accomplished and significant acts in the history of rock and roll. I’ve thought bringing them to Record Club many times, but never with ‘The Good Son’ in mind. Nonetheless, their sixth album, released in 1990, was, for me, a triple turning point. Personally, I’ve loved every album the band made after ‘The Good Son’. All the ones before I like and admire and listen to, but I would line them up behind this one and those which followed. In the context of the band’s career, ‘The Good Son’ seems constitute a taking of breath. The songs, and their playing, is calm. Even when the pace picks up and the heft increases, see ‘The Hammer Song’ and ‘The Witness Song’, there is very little sense of the frenzy, the possession, that charged the earlier records. On ‘The Good Son’ Nick Cave is no longer the deranged swamp church preacher. Now he is in control. Legend has it that fans of the band, perhaps those who had stayed with them since The Birthday Party were at their savage peak, were confused or dismayed at this turn, at the sound of tender piano ballads where they had become accustomed to hollering, slashing blues. But since ‘The Good Son’ Cave and his compadres have released four records which I would consider masterpieces. The frothing Wild West opera ‘Henry’s Dream’, the state-of-the-21st-Century opus ‘Abattoir Blues’, ‘The Boatman’s Call’ – a prayer to love and ‘And No More Shall We Part’ – a recapitulation and perfection of cave’s milleu and the Bad Seed’s brilliance. It seems to me that none of these would have been possible without ‘The Good Son’, which reset the meter for the band and opened up a whole new set of possibilities. Finally, for me, i had a turning point with this album itself. this was The third album i bought by the band, if you include ‘Tender Prey’, which I took back to Piccadilly Records, convinced I had a bad pressing. Thereafter ‘Straight To You’, one of the all time great love songs, was the flame that drew me to Cave, and I loved the album it came from, ‘Henry’s Dream’. ‘The Good Son’, released before ‘Henry’ but purchased after, made little sense to me at all, until suddenly it did. I think Shane MacGowan’s stumbling, winning version of ‘Lucy’, released in 1992 as a B-side to the pair duetting sort of pointlessly on ‘What A Wonderful World’, may have broken me in, or maybe the pure, dripping beauty of ‘The Ship Song’ finally penetrated my stern heart. I don’t think I’d ever clicked with such a slow record, a collection of such apparently plodding songs, but when ‘The Good Son’ came into focus for me it also opened up a world of possibilities which would take me from Tindersticks to Tom Waits, Palace Brothers, Low, Lambchop, Scott Walker and on and on to much of my favourite music today. So, not the Nick Cave & the Bad Seeds record I would have chosen, but the right one for this evening. I firmly believe that the band and their singer songwriter took a big step here and have grown better and better as they have matured in the near 25 years since. In that time they’ve produced albums as rich, complex, self-contained, witty, engaged, moving, poetic, playful and rewarding as anything from Dylan’s back catalogue, but with a tiny fraction of the acclaim. If ‘The Good Son’ was the breath which made that possible, i’m sure glad they took it. Tom Listened: Little do I want to pop Rob’s bubble of bliss since becoming a father less than a week ago, but I have to say that in the case of Mr Cave he’s just plain wrong. Having gone back and listened to 1986’s album of cover versions, Kicking Against the Pricks and then, immediately afterwards, the post Good Son Henry’s Dream…and fully expecting a DRC epiphany, I regret to say that things panned out exactly as I remembered them. The former is, for me, so wonderful, in a teasing, vaguely cheeky, yet wholly reverential way to the originals and it easily surpasses any of the latter works of Mr Cave’s I own (coincidently they comprise solely of the four ‘masterworks’ that Rob has mentioned in his write up). I found Henry’s Dream as patchy as ever – some fantastic songs sure (When I First Came to Town is my favourite) but it doesn’t hold up as a complete work as far as I am concerned. So I guess it makes sense that The Good Son worked for me much more than I expected it would. I knew some of the tunes already (The Ship Song and The Weeping Song) but, on first listen they in no way eclipsed the rest of the material and all the songs seemed to neatly sidestep Cave’s occasional over-earnestness that at times muddies my enjoyment of his later work. So I am very grateful to Rob for highlighting the transition point in Nick Cave’s career but, unlike Rob, I expect I will be exploring the pre Good Son material before delving further into the latter half of his chronology. Nick listened: Like The Smiths, I bought my first Nick Cave record whilst at university; The Boatman’s Call. I loved it dearly at the time, though I’ve come to understand that it’s pretty atypical of his oeuvre. I’ve not really explored beyond that, though; I bought No More Shall We Part when it came out but found it very dry, despite the obvious care and craft that had gone into its construction. The fact that I’m using words like ‘craft’ ad ‘construction’ is telling; I like Cave’s assertion that he works on music in an office, like it’s a day-job, in theory, but something about the outcome didn’t do it for me. I’ve listened to Murder Ballads a couple of times, and the first Grinderman album (which I really quite liked), but nothing more. This was really good though (as was the track from Abattoir Blues that Rob also played), and makes me want to investigate Cave’s ominously large catalogue a bit more. Without contextual knowledge of what came before, or much of what came after, I have no idea if it’s a turning point or not – it sounded like I expected Nick Cave and The Bad Seeds to sound, although perhaps more supple? Graham Listened: It was great to finally find time to listen to a whole album of the man’s work. I have been dipping in and listening since the days of the Birthday Party, but strangely, never felt the need to buy an album for myself. Every time I catch him on the TV performing live I find his work fascinating and engaging. It’s almost as if since he struck out on his own, nearly 30 years later, the size of his back catalogue has become too intimidating to know where to begin. This was great and sounded like something I should own, but reading other members comments, I still don’t know where to start.